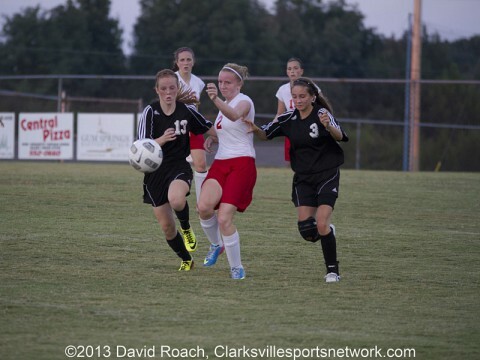 Cunningham, TN – Montgomery Central High School’s girls soccer team finished an undefeated season in District 11-A/AA play, September 26th, but had to do it coming from behind, as the Lady Indians rallied for two goals in the final 44 minutes for a 2-1 victory. When Fairview’s Morgan Mooney scored in the 14th minutes to put the Yellowjackets (8-6, 6-2 District 11-A/AA) up 1-0, it marked the first time since the opening week of the season that the Lady Indians had found themselves behind on the scoreboard. “Fairview is a very good team and even though we went down there and won 4-1 in the first game I told the girls that they would come ready to play,” Montgomery Central coach Gary Gossett said. “Fairview only had one loss (in district play) and that was to us and I knew it was going to be a battle all night. Montgomery Central (10-1, 8-0 District 11-A/AA) would tie the game in the 36th minute, 1-1, on a goal by senior Cierra Adams, off a through ball assist from freshman Chloe Harp. “That goal right before the half was big,” Gossett said. “We as a team seem to play better once we get that first goal out of the way. When Cierra got that goal we played much more relaxed. The game winner for Central came in the 55th minute, as Adams took control of the ball from about forty yards out and dribbled through the Fairview defenders and rocketed a shot into the net. The Lady Indians defense would take it from there, as they limited Fairview to one shot on goal after taking the lead. Overall, Montgomery Central outshot Fairview 13-8 and 7-4 in shots on goal, with both teams taking three corner kicks. In goal, Allison Schmittou recorded three saves for the Lady Indians, while Yellowjackets keeper Anika Sutter made five saves on the night. Montgomery Central returns to action October 1st, as they host Dickson County in what will be the first of three AAA school’s the Lady Indians will face in their final four matches to wrap up their regular season.